Hi Sally, welcome to AD Mag. Explain that further…what does that mean? Creating desire around consumption is essential, if not vital, to the successful exchange of goods and services in our culture. Creating the perception of need – by capturing the imagination and curiosity of the consumer – is a sophisticated process requiring efficiency and skill. I feel that the artist must employ the same tools to seduce, coerce, or captivate an audience (an audience already jaded by endless rhetoric and visual redundancy) in order to take a stand, or at least add a point of view to the historical record. There’s no shortage of merchants fluent in the language of “sale” who offer endless replicas of the world around us. Landscape, for example, has become “real estate,” in all that that implies. In looking at your work you clearly have a fondness—an acute awareness of nature. Has that interest always been there? It has, yes. We moved around a bit when I was growing up, so nature has presented itself to me in various forms. I suppose the extremes would be the tropical, colorful lushness of Miami and the cold stillness of a northern Ohio winter. What matters is the relationship, personal or otherwise, that we have with it, and how we live “locally” with the issue of our natural environment under siege from years of indifference and neglect. We can’t fix the world, but we can tend our own garden. No one else in my family is a visual artist, but they all apply an innate creative sensibility to whatever they are doing. My mother has an extraordinary vegetable and flower garden, for example, that positively transcends the notion of “backyard.” It is through this one-on-one relationship with the earth that she remains sane in a world devoid of reason. One of my brothers-in-law, Thomas Lipinski, invented the hot air popcorn maker (I know, I know, no genetic link). He and his children were frustrated by the tendency of the popped kernels to split apart when they tried to string them to hang on the Christmas tree. He used a blow dryer as the heating element and the rest is history. He worked for a company called Booz-Allen at the time, so, no, he didn’t get the patent. Of course the natural is apparent in your art, but there’s more involved…there’s much mystery and magic. I’m not quite sure where to start first, but perhaps you could talk about Number 99? I don’t want to be too analytical (which would surely neutralize any mystery), but that image is partly rooted in the story of the Trojan horse. The adversary here is our indifference to our global situation and the “horse” is a fabricated likeness that unexpectedly refreshes the earth with the green seeds of life. Could you elaborate more on this topic, for those who are unfamiliar with the Trojan horse story? Also, I don’t want to assume to know what you mean when you say “indifference to our global situation,” so if you could speak to a few specifics of what that might be—what it means, that would be helpful. Rooted in Greek mythology, the story has over time become a broad metaphor for the act of hiding something bad (or dangerous) inside (or behind) something extremely alluring – and it works because our rational instincts are often disarmed by the elegant and seductive. In an effort to lay siege on their arch enemies the Trojans, the Greeks manufactured an enormous, exquisite horse, which the Trojans, against their better judgment, let into their heavily fortified city. Hidden inside the large structure were Greek soldiers who exploited their strategic advantage to the fullest. I suppose you could even say that they conquered their enemy from within. 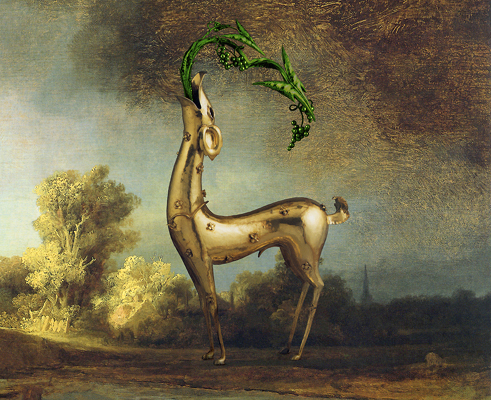 In Number 99 the tactic is modified: a beautiful golden deer enters the scene in an effort to penetrate our stifling atmosphere of indifference (toward anything and everything that doesn’t affect us directly, individually, and economically) – the enemy. The green seeds of life are the antidote, the truth the animal conceals and unleashes from within. I’d like to ask about another image, it’s quite lovely, however haunting. I’m talking about Number 6 which pictures a very stately crow or blackbird of some sort, wearing some king of necklace around its neck. 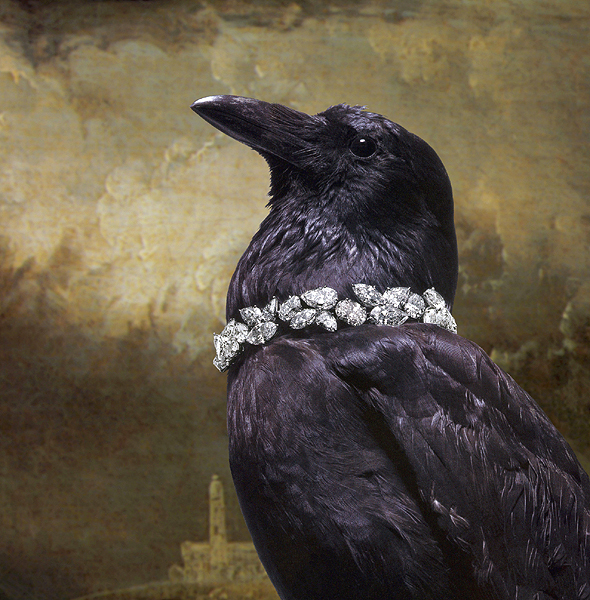 The raven in this picture appears so stoic and noble – perfect as an advertisement for fine jewelry and high fashion. Her tasteful diamonds truly complement her sleek evening wear. Your prints are quite large. They look great online in small scale format, but I can only imaging how intensely fantastical they must be at full scale. And, what of your creation process? If I had to guess, I would say that you are using digital photography, which is then painted? That’s probably a terrible oversimplification, so I’ll let you explain. Actually the process is fully digital. 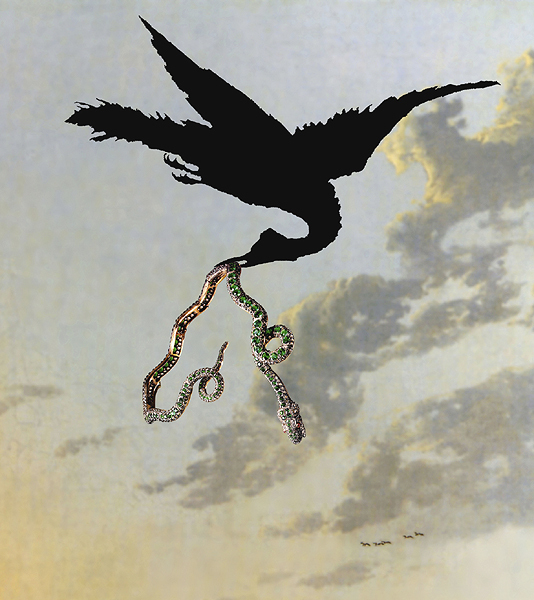 The source materials are reproductions of paintings and photographs, mostly from old auction catalogues, which are scanned and manipulated. One of the technical challenges for me is to integrate the different parts so that there is an overall coherency or plausibility to the image. The digital tools allow me to imagine and execute almost anything that comes to mind. Although it’s a labor-intensive process, my concern is to foreground the magic, not the labor. Your resume reflects a robust exhibition history, and if I’m not mistaken you were just involved in a show. What was its title and how did it turn out? The one you might be referring to is the Hemispheric Institute Encuentro, a festival and conference held every two years in a different city – and country – in the Americas. It’s sponsored by the Hemispheric Institute Performance and Politics, which is based at Tisch at NYU. This year’s Encuentro was titled Staging Citizenship: Cultural Rights in the Americas and took place in late August in Bogotá at the National University of Colombia. My video Certain Woman was screened. I feel extremely honored that it was included. Congratulations on your film screening. And speaking of which, how do you deal with the business side of your art career? I know from personal experience that it can be a daunting task creating and managing all the various details. That’s really true, and something all professional people have to deal with. The ability to manage is more often than not a function of your nature. I happened to be fairly organized and methodical, and that helps in preventing a lot of chaos. I only wish I had more time, but who doesn’t? Do you have any words of advice for younger artist or those who might be interested in elevating a hobby art interest into a full scale career? Be aware of what’s going on around you – not outwardly judgmental of the actions of others, but personally attentive. Raising questions is more important than offering answers. We have to close now, but I would just like to ask about one more image, because I find it so intriguing. “Number 57”, would you talk a bit about that piece? 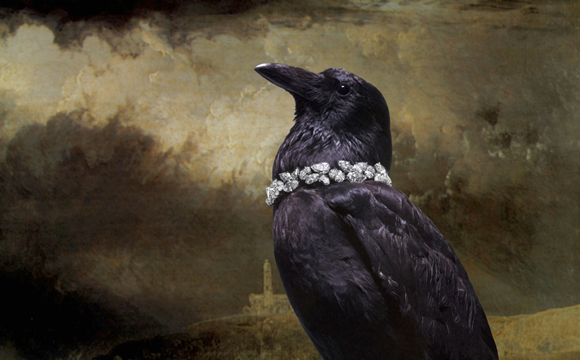 Keep in mind that this work weaves in and out of whimsical cynicism (see “The raven” above). 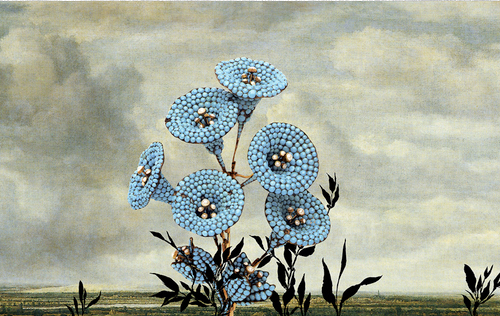 The gaudy blue flowers – jewelry – arrogantly populate a “natural” (painted) landscape. The image concedes to the common practice of replicating natural floral motifs – of co-opting the real with the fabricated. At stake is the experience of the natural relative to the experience of the artificial or simulated. Any thoughts about our digital future? The flood gates are truly open and there is no turning back. Images cannot be contained, and in fact they, like ideas, need to flow freely. My personal interest lies in the possible meanings behind an image, any image, rather than in the substrate behind a picture. Sally, thank you so much for your time. Thank you, Max, very much. AD Mag is updated twice monthly. An archive of prior artist interviews, and other art features can be found here. Visit Larson’s site here.